This map uses the Leaflet JS library with MapBox and ESRI base map layers to show the trail and recreation areas. The map shows mile markers and reroutes. You can find printed maps for your adventure on the Sheltowe Trace. 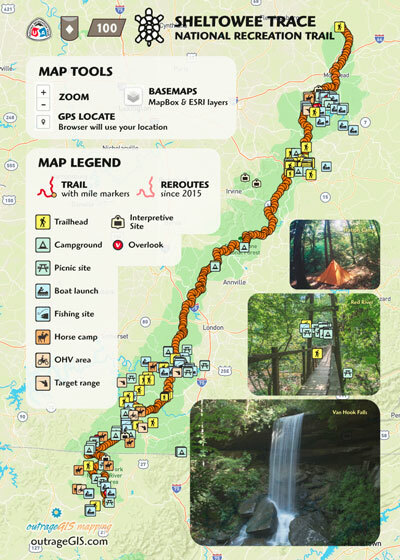 Our maps include all official trails in the Daniel Boone National Forest, Red River Gorge Geological Area, Big South Fork National River and Recreation Area, Cumberland Falls and Natural Bridge State Resort Parks. The most recent printed maps divide the trails into north and south sections on two publications, which are available for purchase with lamination. Maps from previous iterations of the site show recreation areas, printable PDFs, and even Adobe Flash maps. The first interactive maps were created in 2004.